We Are Getting Ready to Celebrate! St. Augustine is located in northeast Florida and is the county seat of St. Johns County, Florida. The City of St. Augustine was founded 42 years before Jamestown, Virginia and 55 years before the Pilgrims landed on Plymouth Rock easily establishing the community as the oldest permanent European settlement on the North American continent. The first known sighting of St. Augustine by a European was by the Spanish explorer and treasurer hunter Don Juan Ponce de Leon in 1513. He claimed the land for Spain and named it La Florida, meaning “Land of Flowers.” Between 1513 and 1563 the government of Spain launched six expeditions to Florida and all failed. The French succeeded in establishing a fort and colony on the St. Johns River in 1564. In response, Spain’s King Phillip II named Admiral General Don Pedro Menendez de Aviles, as governor of Florida, instructing him to colonize the territory and to obtain and protect the land from pirates and settlers from other nations. History changed forever on August 28, 1565 when Don Pedro Menendez arrived off the coast of Florida. On the Feast Day of St. Augustine, with turmphets sounding and flags flying he entered a community of Timucuan Indians and named the village St. Augustine. From there he and his solider’s conquered the French garrison on the St. Johns River and held the coast of Florida for the Spanish. Menendez then began building the town of St. Augustine, establishing missions to the Indians for the Church and exploring the land. He spent the next nine years maintaining and growing the fledgling community protecting it from French and pirate attacks. After the death of Menendez on September 17, 1574 his nephew Don Pedro Menendez Marquez was named Governor of Florida a position he held until 1589. After his death, the King of Spain determined that the Florida territory was to important to Spain’s long term economic future and provide funding for the community. After British colonies were established in Georgia and the Carolinas, Spain authorized the building of a stone fort to protect St. Augustine as assaults from the north became more frequent. The Castillo de San Marcos completed in 1695 after twenty-three years to build stood as the town's stalwart defender. In 1763, Spain ceded Florida to England in order to regain the capital of Cuba, ushering in twenty years of British rule in Florida. This period coincided with the American Revolution, during which Florida remained loyal to the Crown. In 1783, Florida was returned to Spanish rule for a period of thirty-seven years. On July 10, 1821 Spain relinquished control of Florida to US troops. In 1845, Florida became the twenty-seventh state admitted to the Union. The Castillo de San Marcos was renamed Fort Marion in honor of a Revolutionary War hero, and the capital of East Florida was moved from St. Augustine to become part of the state capital in the new town of Tallahassee. Henry M. Flager, led the development of the town as a popular winter resort major area in the 1880s aided by the friend John D. Rockefeller. The popularity of the small community led to the development of golf courses, yacht races, and hotel expansions. Flager was also responsible for building the town’s hospital, city hall and several churches. This time of prosperity extended through the early 1900s. Beginning in 1959, and continuing today, the state has an ongoing preservation effort, meticulously restoring many colonial structures to their original appearance, and historic St. Augustine has become a center of colonial Spanish culture and an important destination for travelers from all parts of the world. This is but a brief overview of the history of our quaint city. Today St. Augustine is a historic city with tourism as the mainstay of its economy. Its many historical sites, miles of Atlantic coast beaches, amenities, boat cruises, museums, and a variety of art galleries creates a place for a wonderful vacation and a beautiful place to live. 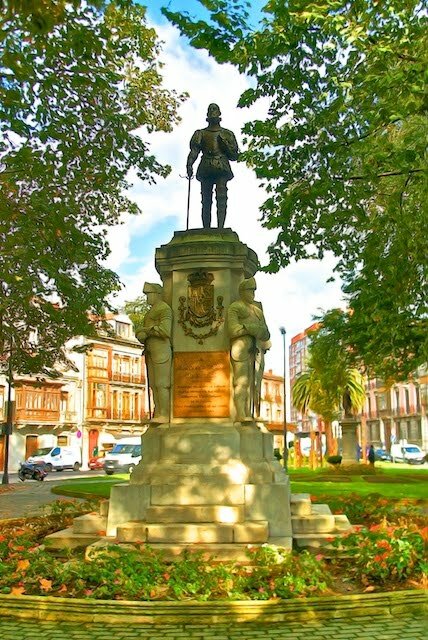 * The photograph at the top of this page is an image of the statue of Don Pedro Menendez de Aviles in Aviles, Spain.